One thing I enjoy about the Mnet Asian Music Awards is not just the red carpet fashion but also the airport fashion ever since they decided to hold the award show overseas. T.O.P or Choi Seung Hyun (최승현) from Big Bang was seen departing Seoul, South Korea for Hong Kong on November 28, 2012. He wore an asymmetric darted coat from Vivienne Westwood Fall/Winter 2012 collection with blue denim, brogues and a blue scarf. At the post 2012 Mnet Asian Music Awards press conference, T.O.P wore a printed coat from Prada Fall/Winter 2012 collection. A white shirt, grey denim and black brogues to complete his look. 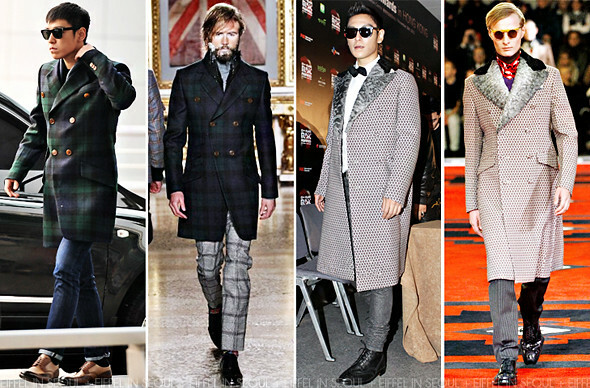 Count on T.O.P to deliver GQ-esque fashion on and off the red carpet. He is definitely one of the best dressed stars in South Korea.